The Noah Webster House & West Hartford Historical Society is located in the restored birthplace and childhood home of Noah Webster. Webster was a national figure known not only for the first American dictionary and the Blue-Backed Speller, but also for being a federalist, an abolitionist, and a cofounder of Amherst College. 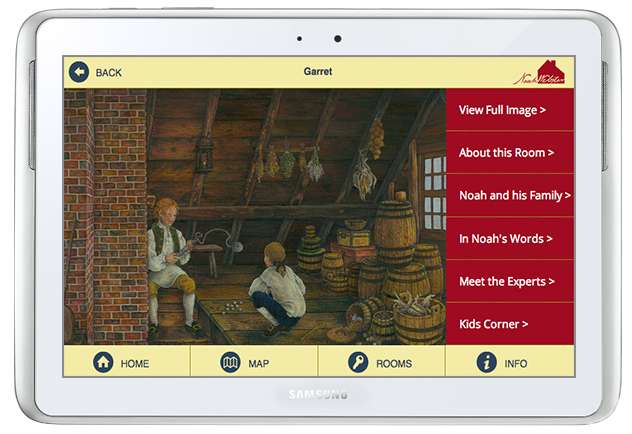 Our team worked closely with the Noah Webster House to create a unique custom design and help build a striking multilingual app. The app was designed especially for onsite tablet devices. It features English and Spanish tours, unique content for children, and closed captioned videos to better meet their accessibility goals. A. Around 4,000 visitors take tours of the house each year. Q. What were the main goals for creating your app? A. We wanted to extend our audience and reach out to the deaf, hard of hearing, and Spanish speaking communities. West Hartford, Connecticut is a highly diverse town and we want to be able to offer an experience that just about anyone can enjoy. We would like to expand the tour to other languages in the future. Q. How does it enhance the visitor experience? A. The videos, object information, and narration give a completely different story than we’ve told in the past. It includes videos of an actor playing Noah Webster and using his words to tell the story of his life. Each one is only a couple of minutes long. We also included videos of local experts talking about and demonstrating a variety of things. Hearth cooking, weaving, architecture, room use, etc. And with the videos for kids, by kids, there’s something for every age group. Visitors love to see the kids react to eating colonial foods that are weird to kids now, like black pudding and clams. Q. How are you using the app? A. We’re using the app on days when we don’t have a tour guide. Q. How are onsite devices used in your mobile strategy? A. We only have four tablets available now, but we’re hoping to add more soon. 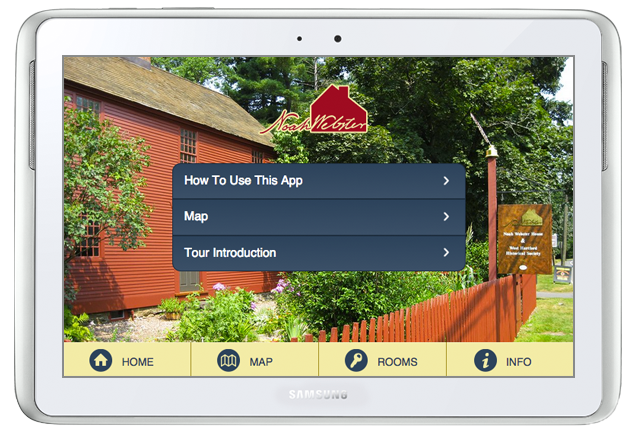 Each tablet is loaded with the proprietary app and can be used by one or more visitors. Q. Why did you choose to have onsite devices only, and not a web or native app for download in the app stores? A. Since the app covers the entire house, we decided not to give away our tour completely. We still want people to come to our site to see the historic house and interact with it and our exhibits. We are planning to post some of the videos and highlights on our website at some point. Q. Can you tell us a little about how you created the content? A. It was a lot of trial and error because we had a ton of information and each room narration was originally about 7 minutes. But visitors don’t want to listen to something for that long, so we found different ways to share the info, like the videos, object information, and the paintings. Q. How did you plan the app? A. We did a survey in 2011 about how people like to tour a museum. Half wanted a guided tour, while the other half wanted a self-guided tour. We can now cater to just about everyone. A. Get funding first! It was a tough road to get planning grants, then have to apply and reapply for implementation grants. The funding was definitely why it took so long to finalize the app. If you can layout your entire plan first and talk to the funders along the way, it will save you a lot of time. In the end, the changes we made along the way have made our tour stronger and more applicable to our site. Q. How are you marketing the app? A. We’ve sent out press releases and emails, but we also have an exhibit space in Blue Back Square in West Hartford Center. It’s a changing screen that includes info on upcoming programs and events. We have the tablet tour in the mix, so hundreds of people see it every day. Q. What part of the app is a staff favorite? A. We LOVE the art! Monica Vachula, the artist behind the imagery, did an amazing job at giving the historic house a more lively look. You can see the room in front of you, then look at the tablet and see what the room might have looked like with the Websters in it. There is a painting for each room, so it’s hard to choose a favorite. Though the Noah Webster House tour is not available for download, visit www.noahwebsterhouse.org to learn more about the lexicographer who strongly believed that the United States had a distinctive brand of English with its own idiom, pronunciation, and style, and published the first truly American dictionary in 1783.